FoundLaw’s post-doctoral researcher Jacob Giltaij will take part in a panel debate at the book launch of Revisiting the Origins of Human Rights (Cambridge University Press 2015) at Tiedekulma/Think Corner Porthania (Yliopistonkatu 3) on November 19th at 3 pm. The event will be livestreamed. 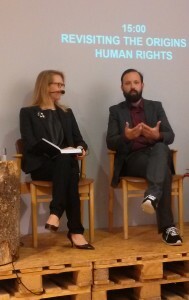 Jacob Giltaij and Miia Halme-Tuomisaari at the book launch.